Victoria has a real treasure in the airport garden complex. Drive past the Regional Airport terminal to Bachelor Drive. Right across from the air traffic control tower, you will find it. First and foremost are the gardens, Victoria Educational Gardens, fondly called VEG. These gardens are the culmination of 12 years of devoted Master Gardener efforts. In the middle of a prairie, an oasis of horticulture now stands. Flowers, vines, fruit, vegetables, turf grasses, trees, bushes, shrubs and wildflowers abound. The gardens are divided into sections to aid in teaching. The first area after one enters the main gate on the west side of the gardens is the children's alphabet garden, with a plant for every letter. There is a real sundial (I tried it), lots of bird houses - and even a life-sized little house for children to get out of the sun. Did I mention the butterfly garden? Purple passion vine attracts the butterflies to the area. Behind the "secret garden" gate is the chrysalis house. If you are lucky, you'll see a butterfly emerge. The vegetable garden is to the right of this, where mainly raised beds hold seasonal plantings. Seeing where the corn, tomatoes, squash and radishes (this time of year) originate can be an eye opener to a 7-year-old. Follow through the children's area to a covered rest spot if you need a break. Don't stay too long, as the best is yet to come. Passing through a rose-covered arbor, the large, spectacular gardens unfold. The daylilies are glorious right now. Actually, the entire garden is glorious, as it should be in the transition from spring to summer. Besides all the lush vegetation, there is a bridged tropical Koi pond with waterfall, a teahouse gazebo, and various other shaded seating areas. Does all this sound like a great venue for a special event? Yes, it does - and it is. 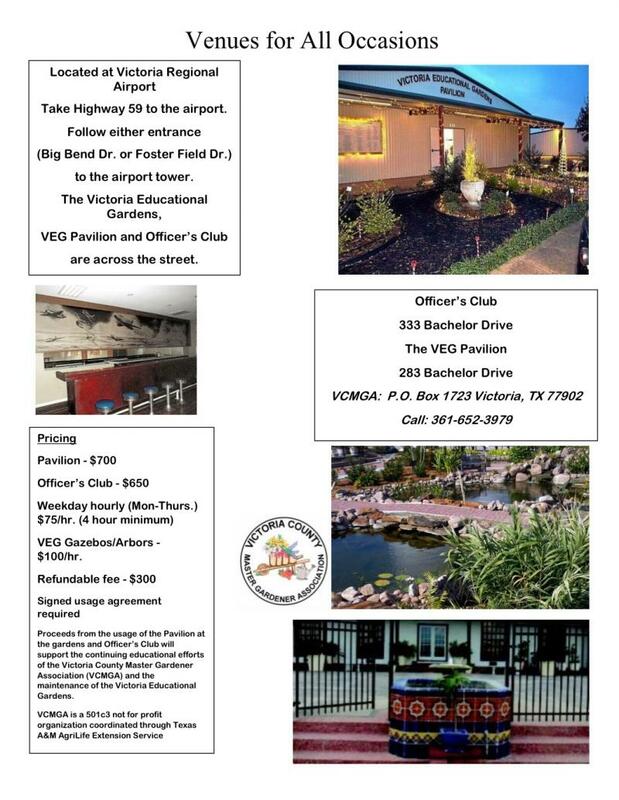 Two different buildings are available to rent right in the gardens: The Pavilion, a Master Gardener Association project completed in 2010, and the renovated Officer's Club of the original Foster Field Air Force base. First, the Pavilion: This more-than-300-person standing-capacity, 6,000-square-foot structure has a stage, break room, restrooms, available seating for more than 200 and 30 tables. In air conditioned comfort, you can host a wedding, another special occasion celebration, a dance, reception, reunion, or a business meeting or seminar. Ample parking is provided. Plus the gardens are right out the door. A short distance away, with its own entrance from the parking area, is the newly-renovated Officer's Club. Master Gardeners have recently assumed the management of this smaller 4,000-square-foot building with lots of charm. It features a large serving bar with a fabulous vintage airplane mural, two dressing rooms, restrooms, and a 100-feet by 50-feet patio overlooking the beautiful pond and gardens. The maximum capacity is 150 people with more than 100 chairs and 13 tables on the premises. An old wooden floor makes this a great place for dancing. A third setting is available for a wedding. A charming gazebo in the gardens down the paved path past the pond can be rented separately. The bride could also rent the Officer's Club, dress there, make a spectacular entrance down the path into a picture-perfect gazebo surrounded by gardens, and then dance the night away. Information for booking these lovely venues is available by calling Texas AgriLife Extension at 361-541-0368﻿. The Master Gardeners look forward to having you in the garden complex for your next special occasion. Look for history of the Officer's Club in a future article. LOOKING FOR A NEW VENUE FOR A SPECIAL OCCASION?